But Islamism is the third totalitarian ideology (following Fascism and Communism). It preposterously proposes a medieval code to deal with the challenges of modern life. Retrograde and aggressive, it denigrates non-Muslims, oppresses women, and justifies force to spread Muslim rule. Middle Eastern democracy threatens not just the West's security but also its civilization. In contrast, the region's unelected presidents, kings, and emirs pose a lesser threat to the West. With Mu'ammar al-Qaddafi long ago chastened by American power and Saddam Hussein removed by American-led forces, the egomaniacs were gone by 2003 and surviving strongmen largely accepted the status quo. They asked for little more than to be allowed quietly to repress their populations and noisily to enjoy their privileges. 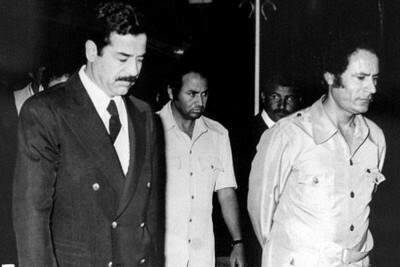 Saddam Hussein (left) and Mu'ammar al-Qaddafi in their salad days (circa 1985). In the Middle East, full tyranny has dominated since about 1970, when rulers learned how to insulate themselves against the prior generation's coups d'état. Hafez al-Assad, Ali Abdullah Saleh, Husni Mubarak, and the Algerian regime demonstrated with rare flamboyance the nature of full-blown stasis. 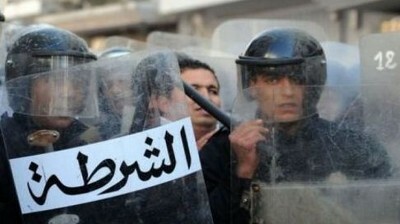 Tunisia's president called out the police in Sidi Bouzid in December 2010, but to no avail. Always oppose Islamists, whether Al-Qaeda types as in Yemen or the suave and "moderate" ones in Tunisia. They represent the enemy. When tempted otherwise, ask yourself whether cooperation with "moderate" Nazis in the 1930s would have been a good idea.